Dr. Jatinder Lamba did her post-doctoral training at St. Jude Children’s Research Hospital in Memphis, Tennessee. She was an Associate Professor at University of Minnesota, Department of Experimental and Clinical Pharmacology and Director of the Pathway driven Pharmacogenomics; University of Minnesota Alliance (PUMA) Institute of Personalized Medicine prior to joining the University of Florida. 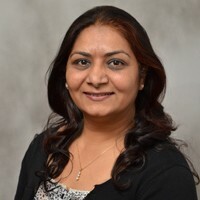 Dr. Lamba’s research is focused on identification, characterization and clinical validation of genomic/epigenomic markers predictive of therapeutic outcome cancer patients. Her research spans from preclinical basic research comprising the discovery phase to translational/clinical phase in patient populations from multi-institute clinical trials. The long-term goal of her research is to move pharmacogenetic testing into the clinical setting to improve safety and efficacy of drug therapy. Dr. Lamba’s research on pharmacogenomics of anti-leukemic agents has been funded by NIH/NCI since 2008. Specifically, her current NCI funded R01 focuses on pharmacogenomics/ epigenomics of cytarabine (ara-C), a nucleoside analog that is the backbone of anti-leukemia chemotherapy in pediatric AML patients. Another NCI funded project focuses on pharmacogenomics of Gemtuzumab ozogamicin (GO), an immunoconjugate utilized in treatment of AML. Other projects in her lab include integrative systems pharmacogenomics to identify predictive markers of response in ovarian cancer patients. Her research utilizes state of the art genomic measures as next-gen sequencing, gene-expression profiling, genome-wide methylation profiling and high-throughput siRNA screening etc. Dr. Lamba has served as chair of Pharmacogenomics SIG at AACP (2013) and is currently vice-chair of Pharmacogenomics focus group with AAPS. She has also served as grant-reviewer for NIH and Italian Ministry of Health. She has published more than 65 research articles in peer-reviewed journals and is on the editorial boards of Leukemia and Lymphoma, Pharmacogenomics and Frontiers in Pharmacogenomics and genomics journal.